K&IM Walford Award: Who Was Dr Walford? What is discoverability and what forms does it take in our quest for information? Although the idea for this issue of Refer was to discuss the role of library catalogues in how we make our discoveries, this article describes a search trail which has led to the creation of catalogue entries which will help in promoting discoverability and adding to our knowledge of the locality close to CILIP in Ridgmount Street. In recent months, I have been researching an area between Russell Square and Tottenham Court Road for a new edition of Camden History Society’s Streets of Bloomsbury and Fitzrovia. I’d been at the Camden Local Studies and Archive Centre (CLSAC) at Holborn Library, looking through some of the well-annotated photographs from the former Metropolitan Borough of Holborn’s collection, mostly arranged by street name. I came across photographs of Alfred Place and Ridgmount Street showing bomb damage sustained on the night of 16/17 April 1941. 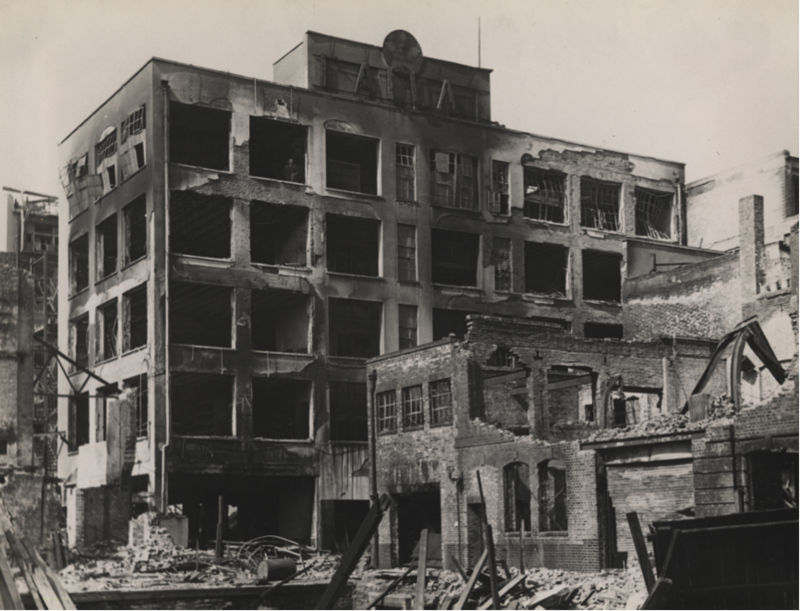 Particularly striking were images of the “damaged beyond repair” Western Synagogue in Alfred Place, and “the Dallas Building” in Ridgmount Place which had been left a burnt-out shell. The Dallas Building was presumably a well-known landmark at the time. To find out what went on there, I consulted the Post Office London Directory (POLD) for 1939 (on microfilm); and under Ridgmount Street, west side, at no.6 is John E Dallas and Sons Ltd, musical instrument manufacturers. A subject search for Library materials on the CLSAC Adlib catalogue (http://adlib.camden.gov.uk/search.aspx) will give you items not only on MUSICAL INSTRUMENT MAKING, but also items for narrower terms identified, namely BAGPIPES MANUFACTURE, HARP MAKING, ORGAN BUILDING, and PIANO INDUSTRY. While CLSAC’s coverage is particularly good on the history of the piano industry and organ building, information on other manufacture not identified is scattered (such as that found in POLD). When I did my original search, there had been just one item on Adlib that included banjo, but was about another firm (H J Fletcher and Co), and none at all for guitar or guitars. To return to the Dallas building, I then tried various Google searches, starting with an unstructured John Dallas, which yielded some 238 million “hits”, including many about the long-running American soap Dallas, or the assassination of President Kennedy. Next, I only needed to get as far as typing “john e d” for John E Dallas (with or without and Sons) to be suggested as an option. The first “hit”, http://www.gracesguide.co.uk/John_E._Dallas_and_Sons notes that John E Dallas originally set up as a music publisher and banjo maker at 415 Strand in 1875. It details other addresses and activities, including the introduction of the trade name Jedson in the late 1920s, and that the firm moved to Ridgmount Street in 1937. However, there is no explanation for the later move to Clifton Street EC2 on this website or others, e.g. Euroguitars and UK Drums. The webpage Defunct musical instrument manufacturers (http://audiotools.com/en_mi_dead_j.html) offers a clearer outline of the development of the firm and its successor companies. More fruitful has been a later search, Dallas Ridgmount banjo. The first hit, British Banjo Makers Part 1 (http://www.whitetreeaz.com/vintage/brit1.htm), has information abstracted from The banjo story, by A. P. Sharpe, serialised in the B.M.G. Magazine 1971-1973. This and Parts 2-4 give some indication that there had been other banjo makers close to Charing Cross Road, Tottenham Court Road and Hampstead Road. Notes Manufacturers of ‘Jedson’ banjos, and later of guitars, drums and other instruments; also printers and publishers of music. 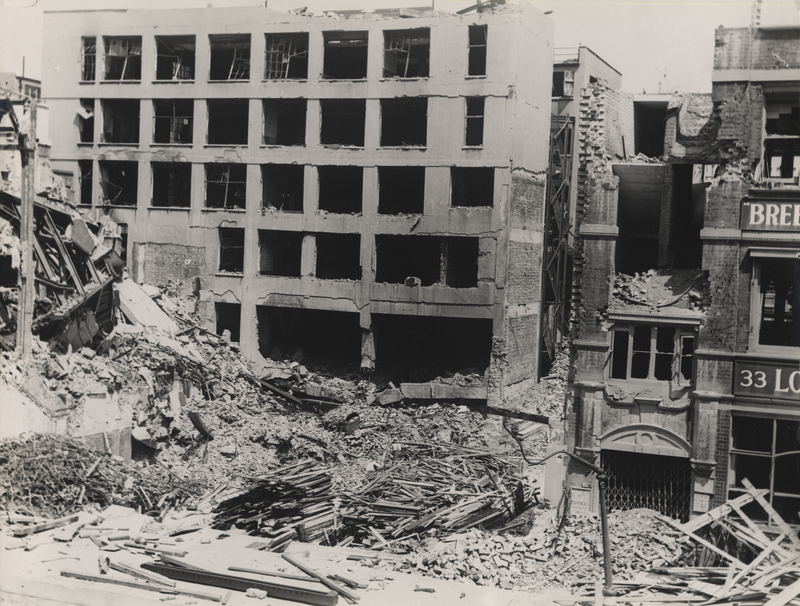 Based at 202 High Holborn (from 1914), 6-10 Betterton Street (from 1926), and in the ‘large white’ Dallas Building, Ridgmount Place, from 1937 until bombed out in an air raid on 16/17 April 1941. Firm subsequently moved to Shoreditch. “Dallas, the big white factory in Ridgmount Gardens, was ablaze. Behind every window on every floor, a wall of flames blowing up. Not much more than an hour …”. I read what I could of the book excerpts on the screen, but decided to look for copies of the original edition (Bodley Head, 1980) using the Find a Book section of the Bookmark Your Library website (http://www.bookmarkyourlibrary.org.uk/find-a-book), where the author is erroneously given as Euan Wallace! 13 public libraries in Greater London have this edition, including Camden and Kingston-upon-Thames (they both give the correct author). Unfortunately, as noted in my review of Bookmark Your Library (Refer 29(3), Autumn 2013, Part 2, pp 16-19), there is no direct navigation to links to the specific item. Then, when going back to Find a Book, you are asked again which country you are in. Information about casualties can be confirmed on the Commonwealth War Graves Commission’s Find War Dead (http://www.cwgc.org/find-war-dead.aspx). Initially, I selected Holborn Metropolitan Borough as the Cemetery or Memorial, Second World War, and Served in Civilian, and then in turn gave Alfred Place and then Ridgmount as Additional information, These searches produced lists of the 27 individual deaths in Alfred Place on 17/4/41, and the 7 individual deaths at the Dallas shelter in Ridgmount Place on 16/4/41 or 17/4/41. To bring our story up to the present, the Dallas building footprint (identified as a “ruin” on a 1951 Ordnance Survey map at CLSAC) is now occupied by modern flats known as Rossetti Court, while on the south side of Ridgmount Place at its junction with Ridgmount Street is where the Library Association, now CILIP, was built in the mid 1960s. At the start of my search, I did not know that I would be looking for information about the banjo industry, my knowledge of which was scant. Likewise, I hope that my “discoveries” about John E Dallas and Sons Ltd have filled a gap for Jedson aficionados. I have reason to believe that my researches about Graham Greene and Bloomsbury are far from complete, and that there is more to be discovered from the literature by and about this author. Hi, I have a strong interest in Bloomsbury during the Blitz and would appreciate the chance to get in touch with the author of this excellent article.